The Broncos are seeded 13th and will take on No. 4 seed Oregon State on Saturday. 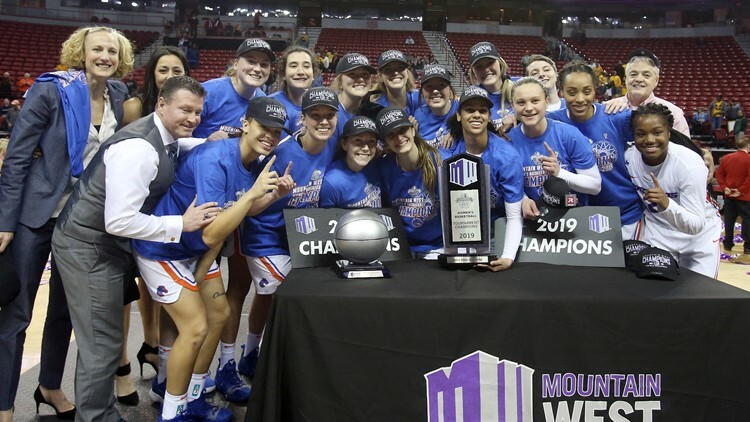 BOISE, Idaho — The Boise State women’s basketball team is headed to Corvallis, Oregon for the first round of the NCAA Tournament. The Broncos (28-4) will face No. 4 seed Oregon State. The Beavers finished the season with a 24-7 record while the Broncos won the Mountain West regular season and conference tournament titles outright. Head coach Gordy Presnell said the team's goal this year was to earn a 'neutral site' first-round game in the NCAA Tournament, meaning they would need to be seeded at least 12th. But despite having the better RPI and championship titles, the selection committee gave that seed to the University of Arkansas at Little Rock. The Broncos were selected as the 13th seed, meaning they would have to go on the road and play in enemy territory. "There are certain things that are completely out of our control that we have no say over and no voice in other than our 39 RPI and 28-4 record," Presnell told the media Monday afternoon. "We would really have liked to have a game on a neutral site, but obviously that wasn't meant to be. The biggest thing is it's pretty disappointing when you're a 39 RPI and they're 61 and the rationale of that is pretty tough to swallow." The game is scheduled to tip off at approximately 3:30 p.m. MDT. It will be broadcast on ESPN2. No. 5 seed Gonzaga and No. 12 seed Little Rock will play in Saturday's first game at 1:30 p.m. MDT. This will be the Broncos' third-straight NCAA Tournament appearance, and sixth all-time. Boise State's 28 victories this season are a program record. The last meeting between the two teams was on Dec. 31, 2000, in Corvallis. The Beavers beat the Broncos 66-55. Oregon State holds a 9-5 edge in the series. The Broncos are led by the play of All-Mountain West selection and Mountain West Tournament MVP Braydey Hodgins, along with fellow All-Mountain West and All-Tournament Team selection Riley Lupfer. Oregon State is led by the play of its guards, former Mountain View High standout Destiny Slocum and Mikayla Pivec. The Beavers finished third in the Pac-12 before bowing out of the Pac-12 Tournament to No. 11 seed Washington, 68-67, in the quarterfinals. Presnell is aware of the presence Destiny has here in the Treasure Valley. The Broncos tried to recruit Slocum while she was at Mountain View, hoping she'd decide to stay close to home and play for her hometown team. But Slocum had several other offers, ultimately choosing to play at Maryland before transferring to Oregon State. "I don't know if Destiny knows where Boise State is," Presnell said. "We tried, we offered her when she was either a freshman or a sophomore in high school." The two-time Idaho Gatorade state basketball player of the year is the leading scorer for the Beavers this season, averaging 16 points per game. "Destiny is a terrific player, she's a highly skilled player, she's a gym rat, she's one of the premier guards in the whole country," Presnell said. "She's a really good player and obviously, anybody would have liked to have her and they (Oregon State) got her." She was recently named a finalist for the Nancy Lieberman Award, which is given to the top point guard in the nation.